stand up paddleboards up to 10'0"
The new 8'2" "bulldog" is a pro surf shape that will tackle most conditions. You can throw your whole bag of tricks at this one. Vertical surfing and noseriding?... who would have thought it possible... till now. * Clear epoxy resin/ fiberglass over a styrofoam core. * 5 fin set up, can be used as a 3, 4 or 5 fin. * High quality 2 section diamond groove custom deck grip with arch bar and raised tail. * fitted Go-Pro mounts on nose. * goretex air vent (stops air expansion inside board on a hot day). * paddle loop plugs in deck. 1] a bamboo paper deck design with clear rails and bottom. please let us know your colour choice when checking out. Please see description above. However, this one has a clear epoxy coating. 2] Yellow top and bottom with clear rails. The " Bat sting" project, is a "selfish"design evolution process by Tim as an ongoing journey to be personally riding the best surfing all-rounder on the planet. "I started surfing in 1973 and have been designing and shaping high performance surfboards for nearly 30 years. In this time, i have had a successful contest career and among other highlights, have achieved 2 x national surfing titles and a Guinness world record. Surfing is my life, my world and i demand performance. I am the best part of 15 stone in my wetsuit. I do not want to waste my energy fighting stability issues. All my energy and power needs to be dedicated to the next big turn. I do not want a board that is too loose and loses drive or not able to paddle it. Or, a board that paddles well but cannot turn it. It is all about compromise and balance of design. The wave catching, blistering speed and "seat of your pants " performance make this board ideal for a dedicated SUP surfer for U.K surf conditions. It is also very stable even on the choppy days. 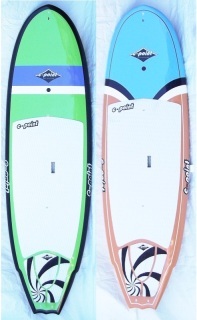 Ideal for experienced SUP surfers up to 16stone. * Painted epoxy resin/ fiberglass over a styrofoam core. 1] black rail with a lime green deck and bottom.